The aim of this study was to investigate the in vitro inhibitory effects of Fucofuroeckol-A isolated from Eisenia bicyclis against tyrosinase activity and 3-isobutyl-1-methylxanthine (IBMX)-induced melanin biosynthesis in B16F10 melanoma cells. Among the ethanolic (EtOH) extract of E. bicyclis and its organic solvent fractions, the ethyl acetate (EtOAc) soluble fraction showed a noticeable inhibitory effect on mushroom tyrosinase with an IC50 value of 37.6 ± 0.1 μg/mL. Repeated column chromatography of the active EtOAc fraction resulted in the isolation of Fucofuroeckol-A. It evidenced more potent tyrosinase inhibitory effect with an IC50 value of 11.4 ± 1.4 μM than arbutin (IC50 = 1076.6 ± 44.3 μM), which was used as a positive control. Lineweaver-Burk plots suggest that Fucofuroeckol-A plays as a noncompetitive inhibitor against tyrosinase. Furthermore, we have evaluated the inhibitory effects of Fucofuroeckol-A on IBMX-induced melanin formation in B16F10 melanoma cells. Fucofuroeckol-A (12.5–100 μM) exhibited a significant inhibition of melanin production in the melanoma cells. In the present study, we suggested that Fucofuroeckol-A might prove possibility as a novel inhibitor of melanin biosynthesis in cosmetic applications. Melanin, a major pigment determines the color of skin, hair, and eyes, is synthesized within dermal melanocytes and plays a crucial role of protection against UV irradiation and oxidative stress-induced skin damage (Hanmura et al., 2008). Melanogenesis, melanin formation reaction, is initiated and modulated by tyrosinase (EC 1.14.18.1) in melanocytes confined in separate cytoplasmic organelles called melanosomes. Skin colors are determined by size, shape, amount, and distribution of occurred melanosomes (Lin and Fisher, 2007). Excessive generation and abnormal accumulation of melanin pigments can lead to hyperpigmentation-related diseases, including melasma, freckles, nevus, ephelis, post-inflammatory hyperpigmentation, senile lentigines, malignant melanomas, and aged spots (Picardo et al., 1999; Brenner and Hearing, 2008; Costin and Hearing, 2007). The inhibition of tyrosinase, a key enzyme of melanogenesis, is one of the most effective methods for suppressing increases in synthesis of the melanin pigment, and its inhibitors have been used to decrease pigmentation of food, skin, and pigmentary disorders in cosmetic, pharmaceutical, and food industry fields for a long time (Chen and Kubo, 2002; Lim et al., 2009; Nihei and Kubo, 2003; Matsuura et al., 2006; Seo et al., 2003; Tsuji-Naito et al., 2007). A variety of tyrosinase inhibitors such as glycolic acid, hydroquinone, kojic acid (Chang, 2009), ascorbic acid derivatives (Pillaiyar et al., 2017), azelaic acid (Hermanns et al., 2002), retinoids (Yoshimura et al., 2001), arbutin (Garcia-Jimenez et al., 2017), tretinoin, N-acetylglucosamine, niacinamide, linoleic acid, ellagic acid, methimazole, dioic acid, and rucinol (Seo et al., 2003) have been used to treat hyperpigmentation (Lee and Noh, 2013; Woolery-Lloyd and Kammer, 2011). However, hydroquinone and kojic acid, well known as skin-whitening agents, have undesirable side effects such as cytotoxicity, skin cancer, hepato-carcinogenesis, and dermatitis (Solano et al., 2006). Therefore, there is a need for safe and effective hypopigmentation agents from natural products, which are useful for the prevention of hyperpigmentation and pigmentation disorders and in the development of cosmetic resource as skin-whitening agents. Eisenia bicyclis (Kjellman) Setchell is a perennial brown alga belonging to the family Laminariaceae that distributes throughout the coastal areas of Ullengdo and Dokdo in Republic of Korea. It has been used as a foodstuff, along with Laminaria japonica, Porphyra tenera, and Undaria pinnatifida. In previous researches, E. bicyclis has been studied its many beneficial bioactivities such as antioxidant, anti-dementia, anti-inflammation, and diabetic complication inhibitory effects (Fujii et al., 2013; Yoon et al., 2011; Jung et al., 2010; Shibata et al., 2007; Okada et al., 2004). In particular, phlorotannins, major metabolites of Eisenia, and Ecklonia species such as Eisenia bicyclis, Ecklonia stolonifera, and Ecklonia cava are polyphenolic compounds in algae and have been reported a variety of positive physiological effects including antioxidant, anti-dementia, anti-hyperlipidemic, angiotensin converting I enzyme, and quinone reductase inhibitory activities (Yoon et al., 2011; Yoon et al., 2008a; Yoon et al., 2008b; Jung et al., 2006; Yoon et al., 2013). In the present study, we have investigated the inhibitory effects of Fucofuroeckol-A derived from E. bicyclis on mushroom tyrosinase activity and intracellular melanin formation in B16F10 murine melanoma cells. We also carried out kinetic analysis to evaluate the enzyme kinetic parameters and inhibition types. 3-(4,5-Dimethyl-2-yl)-2,5-diphenyltetrazolium bromide (MTT), fetal bovine serum (FBS), Dulbecco’s modified Eagle’s medium (DMEM), arbutin, 3-isobutyl-1-methylxanthine (IBMX), dimethylsulfoxide (DMSO), phosphate-buffered saline (PBS), and mushroom tyrosinase (EC 1.14.18.1) were obtained from Sigma Chemical Company (St. Louis, MO). L-tyrosine and K2HPO4 were obtained from Junsei Chemical Co., Ltd. (Tokyo, Japan), and KH2PO4 was obtained from Yakuri Pure Chemicals Co., Ltd. (Osaka, Japan). Dried leafy thallus of E. bicyclis was purchased from Ullengdomall (Ullengdo, Republic of Korea) in September 2014 and was stored in a freezer at − 20 °C until use. A voucher specimen was deposited in the author’s laboratory. The dried powder of E. bicyclis (3.0 kg) was extracted with ethanol (EtOH, 10 L) three times at 70 °C. The EtOH extract (624.3 g) was partitioned successively with organic solvents to yield dichloromethane (CH2Cl2, 170.5 g), ethyl acetate (EtOAc, 90.4 g), and n-butanol (n-BuOH, 100.8 g) fractions, in addition to a H2O residue (262.6 g). The EtOAc fraction (90.4 g) of E. bicyclis was subjected to column chromatography over a Sephadex LH-20 with MeOH, yielding 10 subfractions (EF01-EF10) based on TLC analysis. The RP-18 column chromatography of EF07 (1.6 g) using 40–60% aqueous MeOH led to the isolation of compound 1 (32 mg). The structure of compound was identified as Fucofuroeckol-A and verified via a comparison to the published spectral data (Yoon et al., 2013). where, A = absorbance at 490 nm with the test sample and enzyme, B = absorbance at 490 nm with the test sample and without enzyme, and C = absorbance at 490 nm with enzyme and without the test sample. The reaction mixture consisted of five different concentrations of L-tyrosine (0.5–4 mM) as a substrate and mushroom tyrosinase in 50 mM potassium phosphate buffer. Each sample was added to the reaction mixture at several different concentrations, respectively. 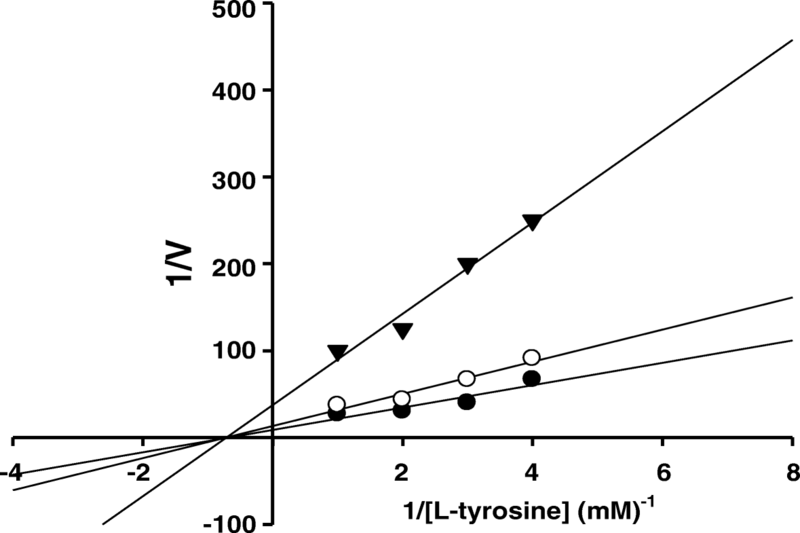 The Michaelis constant (Km) and maximal velocity (Vmax) of the tyrosinase were determined by Lineweaver-Burk plots using various concentrations of L-tyrosine as substrates. The murine melanoma B16F10 cells (KCLB no. 80008) were acquired from the Korean Cell Line Bank (KCLB, Seoul, Republic of Korea). B16F10 cells were maintained in DMEM supplemented with 10% heat-inactivated fetal bovine serum (FBS), 100 units/mL penicillin G, and 100 mg/mL streptomycin and cultured at 37 °C in a humidified atmosphere with 5% CO2. The cytotoxicity levels of compounds on melanoma B16F10 cells were assessed via the MTT method as described by Mosmann (Hansen et al., 1989). The cells were grown in 96-well plates at a density of 1 × 104 cells/well. After 24 h, the cells were washed in fresh medium and treated with different concentrations of samples. After 48 h of incubation, the cells were rewashed and 100 μL of MTT solution (5 mg/ml) was added and incubated for 4 h. Finally, DMSO (100 μL) was added to solubilize the formed formazan salt, and the amount of formazan salt was quantified by measuring the absorbance at 540 nm using a spectrophotometer (BioMate 5; Thermo Electron, Waltham, MA, USA). Relative cell viability was determined by the quantity of MTT converted into formazan salt. Relative cell viability was calculated compared to the non-treated control group. The melanin content of melanin formation in murine melanoma cell was determined in accordance with the procedure described by Hosoi et al. (1985). The B16F10 melanoma cells were seeded at a density of 2 × 104 cells per well in 24-well culture plates and then incubated for 24 h. The cells were treated with various concentrations of sample (12.5–100 μM). After 1 h, 100 μM 3-isobutyl-1-methylxanthine (IBMX) was added and incubated for 72 h. The cells were washed twice in PBS and dissolved in 1 N NaOH (in 10% DMSO) by 30 min of boiling (60 °C). The lysates were centrifuged for 5 min at × 3000g, and then, the absorbance value of the supernatant was measured at 405 nm. Data were expressed as the mean ± standard deviation (SD) values of three experiments. The means were statistically analyzed using Student’s t test. Values of p < 0.001, 0.01, and 0.05 were considered statistically significant. In this study, we attempted to estimate the tyrosinase inhibitory activities of the EtOH extract derived from E. bicyclis, along with its solvent soluble fractions, including n-hexane, CH2Cl2, EtOAc, n-BuOH, and a H2O layer and their data were shown in Table 1. Among the EtOH extract of E. bicyclis and its partitioned fractions, the EtOAc-soluble fraction exhibited the most potent tyrosinase inhibition activity IC50 value of 37.6 ± 0.1 μg/mL. The EtOAc fraction exhibited more noticeable inhibitory activity on tyrosinase than that of arbutin (IC50 value of 299.3 ± 12.3 μg/mL), which was employed as a positive control. According to the previous studies, the EtOAc fraction of E. bicyclis contains above 70% polyphenols and it is composed of phlorotannins, representative polyphenolic components of Eisenia sp. (Yoon et al., 2011; Yoon et al., 2013). For further phytochemical investigations, we undertook the isolation of bioactive compounds from the active EtOAc fraction via repeated column chromatography over Sephadex LH-20 and RP-18 gel, which led to the isolation of one compound. The structure of compound was verified by spectroscopic analyses and identified by comparisons to published data (Elyashberg, 2015). The chemical structure of compound was identified as Fucofuroeckol-A (Fig. 1). The inhibitory effect of Fucofuroeckol-A against mushroom tyrosinase was also evaluated (Table 2). Fucofuroeckol-A showed potent inhibitory activity on tyrosinase with IC50 values of 11.4 ± 1.4 μM. In particular, Fucofuroeckol-A evidenced inhibitory effects 94-fold stronger than that of the positive control, arbutin (1076.6 ± 44.3 μM). The inhibition kinetic study of Fucofuroeckol-A on tyrosinase-induced L-tyrosine oxidation was determined by using a Lineweaver-Burk plot. The Lineweaver-Burk plots in the presence of Fucofuroeckol-A yield three straight lines with different slopes and with a common intercept on the X-axis. Its kinetic parameters of tyrosinase were shown in Fig. 2 and Table 3. The Ki values of Fucofuroeckol-A were estimated to be 1.3 μM at 2.3 μM and 6.4 μM at 7.4 μM, respectively. The tyrosinase inhibitory activity of Fucofuroeckol-A exhibited the same Km value of 1.4 × 10−3 M and Vmax values of 7.5 × 10−2 and 2.7 × 10−2 ΔOD 490/min at 1.3 and 6.4 μM, respectively. Therefore, these results indicated that Fucofuroeckol-A was identified as a noncompetitive inhibitor of the mushroom tyrosinase which can bind with both the free enzyme and the enzyme-substrate complex, and the equilibrium constants are the same. To further verify the inhibitory property of Fucofuroeckol-A on melanogenesis, we examined the inhibitory effect of Fucofuroeckol-A on IBMX-induced melanin synthesis in murine melanoma (B16F10) cells. We first evaluated the cell viability of Fucofuroeckol-A and arbutin, used as a positive control, using MTT assay on B16F10 cells. These exerted no cytotoxicity on B16F10 cell in the concentration range of 12.5–100 μM and 0.5–3.6 mM, respectively (data not shown). Thus, we investigated the inhibitory effects of Fucofuroeckol-A on IBMX-induced melanin synthesis in dose range without cytotoxicity. IBMX, a well-known melanogenesis stimulator, act as a potent cyclic adenosine monophosphate (cAMP) phosphodiesterase inhibitor and is increased cAMP in melanocytes (Röhrig et al., 2017; Levy et al., 2016). cAMP is regarded as a key messenger in the regulation of melanin synthesis. It has been shown to induce significant elevations in melanin production following a single treatment in melanoma cells (Buscà and Ballotti, 2000). 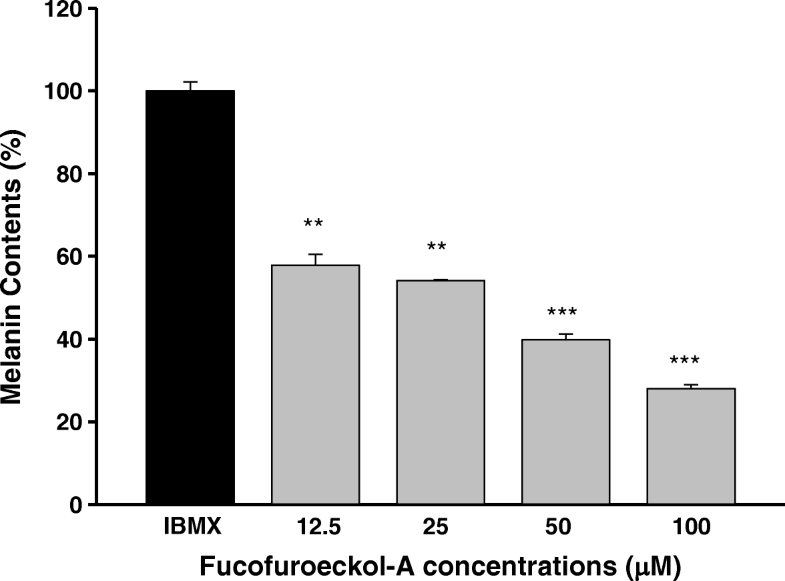 Fucofuroeckol-A exhibited significant inhibitory effects against melanin synthesis and reduced significantly its melanin content in a dose-dependent manner on IBMX-induced melanin synthesis in B16F10 cells (Fig. 3). 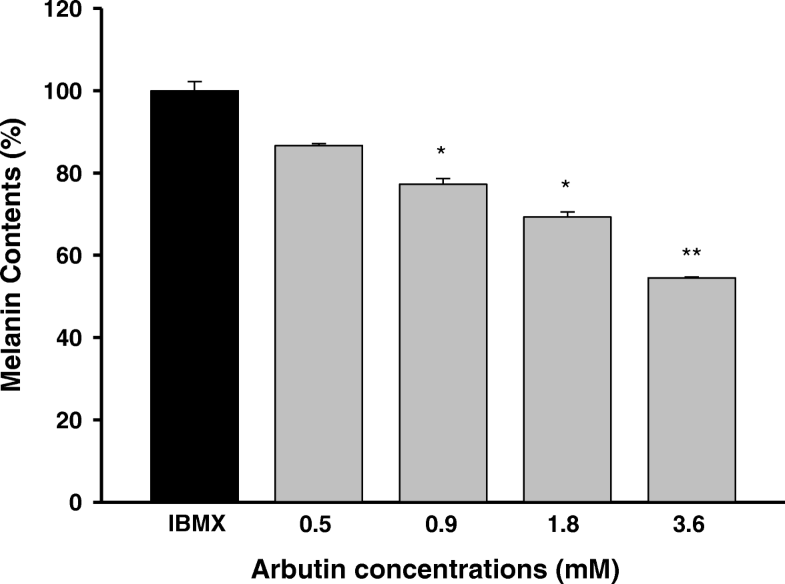 However, arbutin, used as a positive control, showed a moderate melanin formation inhibitory effect and its melanin contents declined at the concentration range of 0.5–3.6 mM on IBMX-induced melanin synthesis in B16F10 cells (Fig. 4). As shown in Table 4, Fucofuroeckol-A with EC50 value of 31.9 ± 2.8 μM was shown to function as a potent melanin production inhibitor on IBMX-induced melanin production in B16F10 melanoma cells and its efficacy was much better than that of arbutin (EC50 = 4100 ± 257 μM). In the present study, it was demonstrated that Fucofuroeckol-A exerted significant inhibitory effects on both mushroom tyrosinase and melanin synthesis in melanoma cells. According to previous researches, the inhibitory effects on the mushroom tyrosinase and melanin synthesis in melanoma cells of various phlorotannins such as phloroglucinol, dioxinodehydroeckol, eckol, phlorofucofuroeckol-A, dieckol, and 7-phlorockol derived from Ecklonia stolonifera and Ecklonia cava were reported (Kang et al., 2004; Yoon et al., 2009). However, this is the first report concerning the hypopigmentation effects of Fucofuroeckol-A derived from Eisenia bicyclis. The various biological activities of Fucofuroeckol-A have been investigated, including pancreatic lipase, α-glucosidase and α-amylase inhibitory activities, antimicrobial and antibacterial effects, and quinone reductase induction activity (Eom et al., 2012a, b and 2013; Lee et al., 2015; Yoon et al., 2013). Arbutin, used as a positive control, is a well-known tyrosinase inhibitor. However, despite its low efficacy, it has been commercially used as skin-whitening cosmetic ingredient and medicinal agent for the treatment of a variety of cutaneous hyperpigmentation disorders because of its safety (Solano et al., 2006). In the present study, we have demonstrated that the ethanolic extract of E. bicyclis and its bioactive compound, Fucofuroeckol-A, exhibited potent inhibitory effects on mushroom tyrosinase. 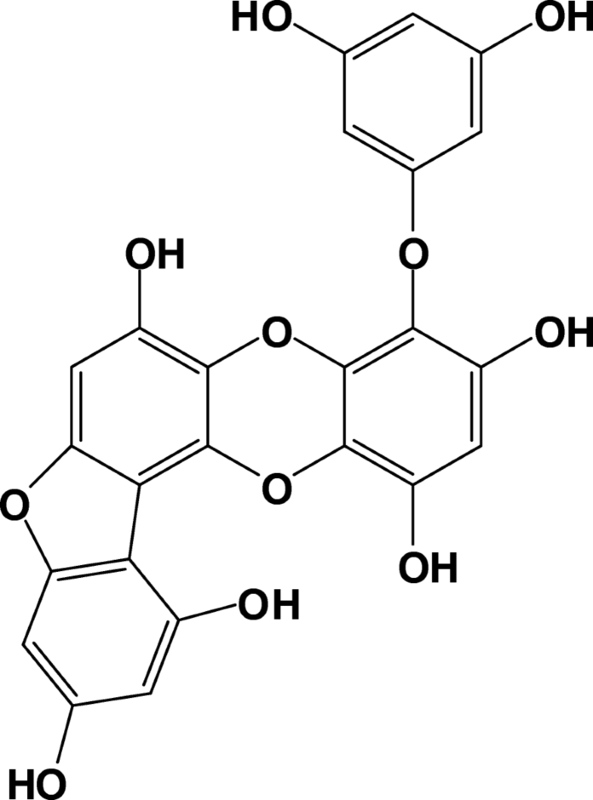 Fucofuroeckol-A was also identified as a noncompetitive inhibitor against mushroom tyrosinase and evidenced a significant inhibitory effect on IBMX-induced melanin synthesis in B16F10 melanoma cells. Therefore, these results indicated the possibility of Fucofuroeckol-A from E. bicyclis can be a good candidate as a hyperpigmentation inhibitor or a skin-whitening agent in cosmetic industry. Furthermore, we plan to conduct additional studies into the mechanisms underlying the inhibitory properties of this compound. In the present study, we were demonstrated that the ethanolic extract of E. bicyclis and its bioactive compound, Fucofuroeckol-A, exhibited potent inhibitory effects on mushroom tyrosinase. Fucofuroeckol-A was also identified as a noncompetitive inhibitor against mushroom tyrosinase and evidenced a significant inhibitory effect on IBMX-induced melanin synthesis in B16F10 melanoma cells. This study was supported by a grant from the National Institute of Fisheries Science (R2018061). KB Shim and NA Yoon designed this study, carried out the analysis of the extraction and biological activities for skin whitening from Eisenia bicyclis, and drafted the manuscript. Both authors have read and approved the final version of the manuscript.